Just as I was getting ready to turn my phone on silent for church last night, I got a text from Pat about Rafael Furcal’s appearance being canceled. Matt Kemp was his replacement. Since we were only going to the Verizon appearance because it was going to be Furcal, we had a change of plans. Now that Furcal was no longer signing, we were free to go to KABC’s signing. I knew from past experience that people showed up really early for Broxton’s appearances in times past. Even though this was Broxton’s fourth appearance this year, I still expected a rather large crowd. I showed up super, super early (I won’t reveal the actual time) and there was someone already there. So, I set up my chair and got back in the car. Mike and his neice had gotten there at midnight and were camping out in their car. I got back in my car and read till Starbucks opened and then got a white mocha. The next person to show up was Alan (sp?) and that was about two hours after I had gotten there. It was almost two more hours before the next person showed up. And it gradually growed from four people to seven! Yay! We were so surprised how little the crowd was. Even though this was his fourth appearance, and he was recently demoted from his closer role. And there were two other appearances today. Kemp in Commerce and Fernando Valenzuela at West Covina. The KABC reps started showing up around 7. Unlike the Dodger rep (just one), who showed up at the last hour at Ellis’ signing. The great thing about this location, it was next to Starbucks and there was Noah’s Bagel right there too. We helped KABC block off some parking spaces for their vehicles and tent. The line grew gradually, but I’m sure it was nothing like the lines at the other two signings. Jonathan Broxton showed up a little late. Then they started letting us in, taking groups of five or so at a time. Alan got a smile out of Broxton. I won’t share how he did it. But it was a rare sight indeed. He was Broxton being Broxton and didn’t say much. He signed my 2009 scrapbook, newspaper clipping from the All Star game for my 2010 scrapbook, and my team ball. Someone in line behind me called out, “I think you need a bigger baseball.” It’s got somewhere between 18 and 20 autographs on it. 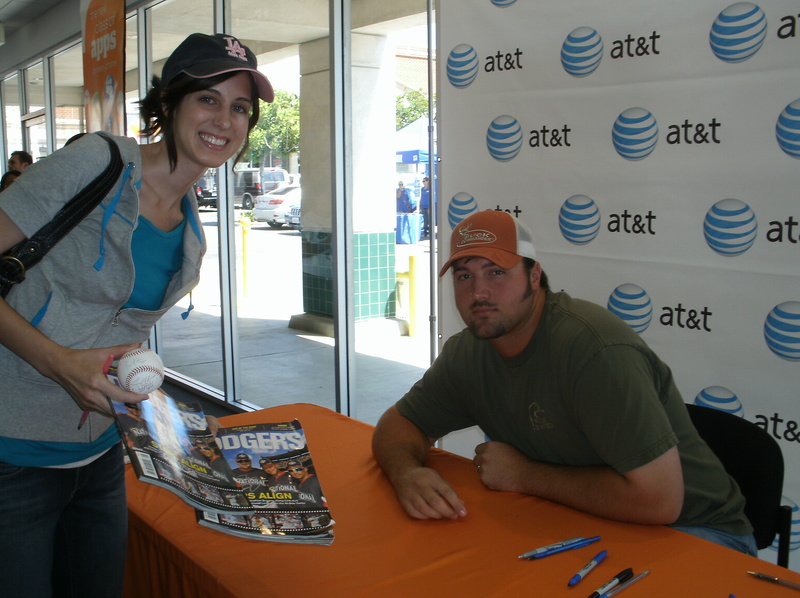 I finally got a photo with Jonathan Broxton. This is the first time I’ve gotten my picture with him. Angelina went next. She had her team ball (not any specific year) and two magazines, one for her boyfriend and one for our friend Nina. Then she got a photo with him too. Over all, great signing again! It’s always great to be at a KABC signing. I’m looking forward to my next one. Oh yeah, I was watching him while he was signing for our group. Didn’t see him reach for a bottle or spit once while we were there! Interesting…. 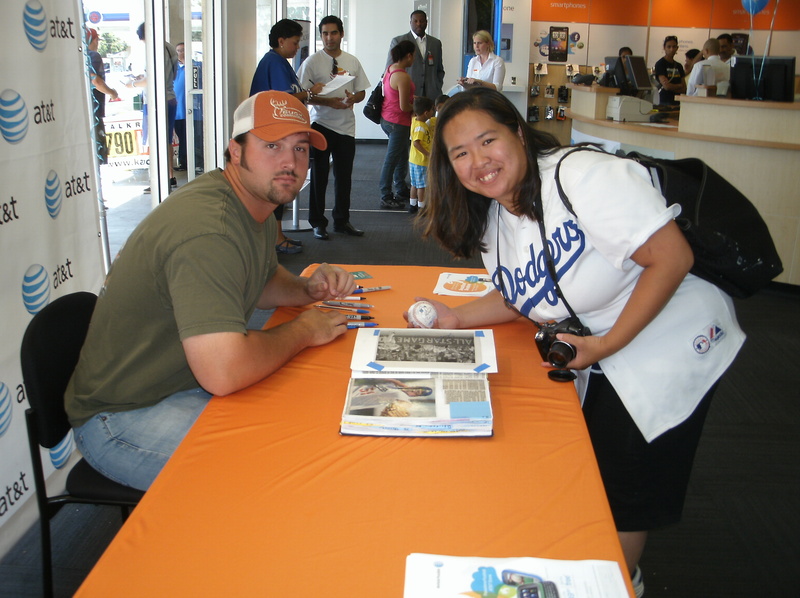 Here’s a recap from the previous Jonathan Broxton appearance at Sports Authority in Burbank, posted by Roberto over at Vin Scully is My Homeboy. Saturday, I knew everyone was going to be all over him. What was it? 25 saves in 30 save opportunities. That’s at least five blown saves. 1 – 1 record); Francisco Rodriguez (Mets, 26/31 with a 3 – 4 record). chances, has a record of 0 – 5.
the right word that I’m looking for?) of one to three. And again …. opportunities with a 0 – 1 record. Broxton also has the most wins. done a LOT this year. Lidge the way people here in L.A. are reacting to Broxton. Remember? opportunities, that should equal the number of blown saves. and have confidence in the guy. Am I panicking when he comes out? No. they don’t give you the relief you’re looking for. Just apprehension. Broxton can close out the game. Lights out. Game over.